With The Birchwood Group you have a number of ways to reach your audience via the web utilizing our signature communications modules ... Meetings On-the-NetTM . Begin by exploring our Present On-the-NetTM service, a comprehensive live meeting/seminar solution for up to 1000 participants. Make it last with our Broadcast On-the-NetTM archive web service, which adds a 24/7 resource library to your web presence. Make it ongoing with our Forum On-the-NetTM online community, a full-featured threaded message board. Take advantage of our turnkey approach to Internet based programs with Meetings On-the-NetTM and you will begin to appreciate the benefit of creative invitations, automatic email and list management services. As your partner, The Birchwood Group management team works to insure that your strategy and objectives are implemented as outlined by your iMAPTM , our internet Meetng Action Plan. Throughout the process, our creative group works closely with you to design innovative media for program enhancement. We are also experts at re-purposing your existing PowerPoint, Flash and video programs for Internet delivery. 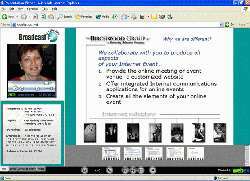 For live meetings use our Present On-the-NetTM conferencing service. Your audience will all view the information simultaneously through a live meeting interface as either a webcast, web conference or webinar. Depending upon the requirements, audio will be sent via the phone lines or be included on the computer webcast. ask their questions through the Q&A area. A Birchwood Group producer directs the event, and a professional moderator interacts with your presenter(s) to ensure that the program runs smoothly. Your host/stage manager co-presents and runs the technology throughout the entire meeting, partnered with an event co-ordination director, and backed up by our live tech support team. Every aspect of your live event is professionally managed to ensure a successful outcome and concluded with comprehensive tracking for follow-up and ROI closure. Broadcast On-the-Net, our on demand archive service, can be utilized as an extension of a live webinar or as a stand alone service. The on demand service allows you to reach participants who are unable to attend the live event. In addition, certain topics lend themselves to long term accessibility as archived only, Broadcast On-the-Net program libraries. Depending upon your requirements we will recommend a streaming audio and/or video program with synchronized visuals, chapter viewing, transcribed copy Etc. Participants would simply register at your web communications portal, to obtain access and view the materials. Depending upon the program's timeline, these program elements can be made available for a number of years. Again, all is professionally managed to ensure a successful outcome with comprehensive tracking for follow-up and ROI closure. For long term communications, we offer Forum On-the-NetTM, a simple and comprehensive interactive message community. Used as either a stand alone tool, or as the follow-up to a program, this is a low tech information dissemination solution. Offered as another add-on module of our web communications portal Update On-the- NetTM service, this is a private customized threaded message board. Utilizing Forum-On-the-NetTM, documents can be posted for review with a central area for topic discussion and Q&A. All comments can be available to an entire team - or multiple levels of access can also be assigned, to allow the viewing of information by only the appropriate audience. Word, Excel, photo images Etc can be uploaded to a designated area in the forum by authorized participants. Power Point programs can even be added for review, with text explanations included, to reach people with limited Internet capabilities. Another added plus of Forum On-the-NetTM ... All of the information exchange is done in text form, allowing you to save and document all communications involving a topic.